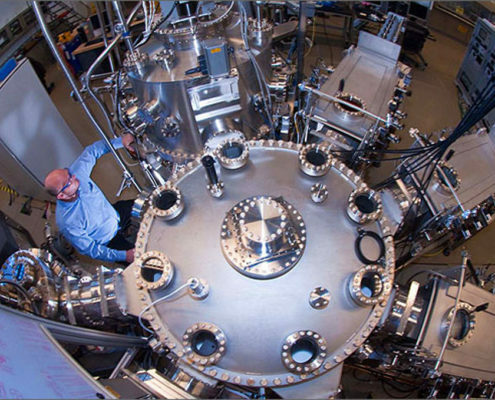 The Copper Indium Gallium Diselenide (CIGS) cluster tool in the Process Development and Integration Laboratory at the National Renewable Energy Laboratory (NREL) includes chambers for depositing, processing, measuring, and characterizing photovoltaic materials and devices. The cluster tool was designed in close collaboration with NREL scientists and DCA engineers. The techniques include evaporation in the customised P1000 MBE chamber, radiofrequency, direct-current (DC), and pulsed DC sputtering in three custom design UHV sputtering chambers. An Auger electron spectroscopy (AES) analytical tool designed and build by DCA was added for surface analysis.